Weather: Sunny and sometimes very warm Average 25C ! Woke up at 07.00 Breakfast was a roll with cheese and an apple pie with a 'frappe' Took care of my foot (bit better now) and waited for Michalis, the taxi driver. Exactly at 08.30, as agreed yesterday, Michalis passed by and brought me to Vagionia. Very nice man, friendly, clean (so was his car) and very helpful. I recommend this man to everybody, needing a taxi in the area ! Today I am feeling better too.. Christina, Guido and Andre, will come to visit me in Lentas, where I will overnight at the house of Reiner and (another) Christina, friends of Guido. It is sunny, but still a little cold (19C), because of the north wind..no, not again ! The Messara plain looks very green, huge and fertile. In Vagiona I arrived 20 min later and drank my "elleniko sketto" at the local cafenion, observing an old man, Lefteris, crossing the "platia" to look for his medicines at the pharmacy..
Getting warmer now (21C) and I start walking at 09.10 Farmers driving to their olive fields, having those big plastic barrels at the back of their field tractors.. Wonder what's in these barrels.. 100% Virgin olive oil, I read on an abandoned bottle... Lots of old houses here, but everyone of them has a lot of flowers in the small gardens, giving the necessary color to the owners' life. Nice ! I leave the village, the school is on my right. Building looks dirty and not maintained..Children are playing outside and having fun. Warm now (26) and only 09.30 Not one cloud ! I spent again 15' on an almond tree, sniffing the superb perfume and watching the working bees. Magnificent "black birds"are playing around. 10.25 I reach the village of Vassiliki. A man is selling "aspro katharo asvesti"..from Agios Nikolaos. Asbest ? In fact it are white stones, to make chalk.. Small village, but children (10) are playing at the local school yard. A barrel dog is barking at me. I see no food and water. The house is abandoned... Dog looks good but is very agressive. 10.45 I am out of Vassiliki and walking on a dirt road. This is the end...only nature..Total peace. It is climbing now to the next village. Lots of dust and very hot (31C) ! 11.10 I see the Lybian sea again.. Nice feeling. I am at an incredible valley now. Beauty at its best. Just at the junction to the beach of Agia Paraskevi, a police jeep is passing me.. Going for a swim ? At 14.40 I pass a small goat farm in the valley. Two women are living here. Stavroula and her sister. "Its a hard life.." they tell me. Certainly in the winter. They have no electricity of running water.. Surrounded by goats and sheep, but in the middle of nowhere in the most beautiful nature! They live from olive oil production, produced cheese and the sales of goats and sheep.. Well I think I could do this too... My left foot is much better and causes no big problem anymore, but still hurting a bit. Three eagles are circling above my head.. The same as yesterday ? 12.30 Passing some shepherd places now. Barrel dogs, all by themselves. I am arriving at the village of Krotos. A donkey welcomes me as well as some roosters. Peaceful little mountain village with only 70 (old) people living there. Young ones left for Mires, Heraklion etc..big cities. I stop for 10' and talk to some locals, telling me that they have problems to survive.. Some people are renovating a small house. I leave the village at 12.55 and count 3 donkeys. Nikos, sitting peacefully on his field tractor (he is 74) asks me if I have a camera. yes. Do you want to make a picture from me ? Of course ! Thank you, he said, after I showed him the picture. I will be back there and bring him the photo.. Wonderful man, ful of admiration for the Kofinas mountain, just behind the village. On my right the sun, on the left the moon ! I can almost see them together. The Lybian "lady" smiles at me.. Lentas below. What a beautiful bay ! Foot causes no problem now and is heeling slowly slowly I hope.. I take 10' rest at a "point of view" and make the last 4 km to Lentas. Suddenly the support car passes me.. Good feeling. They will wait for me at the taverna "Petros".. Arriving at the village at 14.15 and drinking a beer at Petros' taverna with my friends. 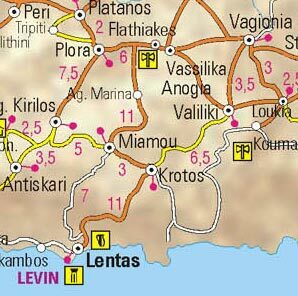 After we will go to Reiner's place in Tsigonas, a small place at 4 km from Lentas. We met also Joel, a Belgian, living in Dytiko, near Lentas. He works in the tourist area in the summer and plants trees in the winter, thus making the area much greener. He lives in his "cabane" when it is getting warmer, just the perfect Robinson Crusoe !